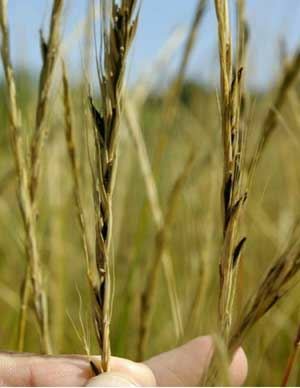 Ergot has been reported in several hayfields and pastures across southwest Missouri according to University of Missouri Extension Agronomy Specialist, Sarah Kenyon. “Death can occur when livestock consume large amounts of ergot. That is why I urge farmers to scout their fields now to determine if this pest is present,” said Kenyon. Ergot is an airborne fungus that affects grass seed heads. Wet, cool weather followed by high heat and humidity create ideal conditions for ergot growth. This fungal infection creates hard ergot bodies in the seed of grasses. The ergot bodies look like mouse droppings and are visible in the seed head of cereal grains like barley, oats, wheat, triticale and rye, as well as common grasses such as timothy, perennial ryegrass and tall fescue. “When livestock consume ergot they appeared to suffer from extreme heat stress,” said Kenyon. Cattle may seek relief in the shade or stand in water. Other symptoms might include rapid breathing, sloughing of the switches of tails and tips of ears, abortion, and decreased milk production. Livestock deaths may result when livestock consume large quantities. Ergot produces alkaloid compounds that are toxic to livestock and humans. The toxins constrict blood vessels, increasing respiration rates, raising core body temperatures, and limiting blood supply to the extremities. Ergotism can be confused with fescue foot or fescue toxicosis because the symptoms are similar. However, ergot bodies (the ones that look like mouse droppings) have a thousand times more toxic alkaloids than those of fescue toxicosis. Because the toxin concentration is so much more, the animal symptoms appear quicker and are much more pronounced. 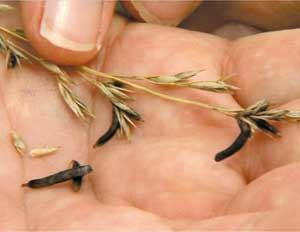 Ergot bodies are dark elongated growth on grass seeds and look like mouse droppings. Ergot alkaloids are toxic to many species, including other ruminants, llamas and alpacas, horses, and even swine, dogs and humans eating infected grains. Ergot poisoning has also been linked to human epidemics in the Middle Ages.